Another factor Bloomberg noted was that the weakening demand for manufacturing supplies was due to falling oil prices that would allow manufacturers to get goods and materials for less. Four months later, the optimism had softened. Bloomberg Business published a story on April 14 called “Strong Dollar’s Economic Ax to Fall on Small U.S. Exporters.” The story explains how large U.S. multinational companies have the ability to meet the challenges of a strong U.S. dollar, while small exporters do not as they have far fewer products or SKUs that they produce. 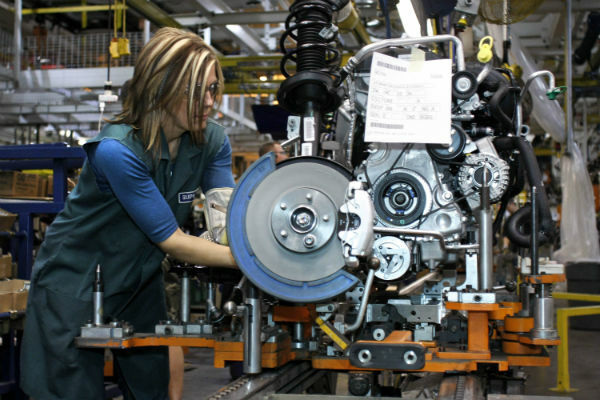 The next day, Bloomberg published a new story called “Manufacturing Struggles With U.S. Dollar Rising, Oil Falling.” This article discusses how other than cars, U.S. manufacturing showed no growth in March. Manufacturing did increase 0.01 percent in March, but this was the first advance in four months and does not make up for the February loss of 0.2 percent, according to the Federal Reserve. Job growth will be the primary source of energy to grow our economy, and the growth of investment will come from our natural gas resources and infrastructure, the U.S. transportation infrastructure, the housing supply chain, medical care expansion, increasing consumer confidence and factory automation. “The manufacturing sector experienced a small 0.1 percent output gain in March after contractions in January and February and zero growth in December. Nonetheless, the short-term picture for the U.S. factory sector is fairly bleak. Manufacturing production fell by 1.2 percent during the first quarter of 2015, the first quarterly contraction in factory sector output since the second quarter of 2009. Additionally, the March report also forecasts businesses will spend more on both intellectual property and equipment, along with a small increase in stock prices. Also, the report stated that oil prices will stay under $70 per barrel through the end of 2016, which will spur manufacturing growth. “Healthier consumer spending, housing investment and government spending growth are expected to make outsized contributions to the projected acceleration in overall economic activity. Accordingly, recent labor market strength is expected to continue,” John Silvia, NABE president and the chief economist at Wells Fargo, said in a statement. Reduced predictions for increasing hourly wages by 0.01 percent from its original forecast of wage growth of 2.5 percent. Lowered company profit forecasts from December’s forecast of 6.7 percent to 4.7 percent.